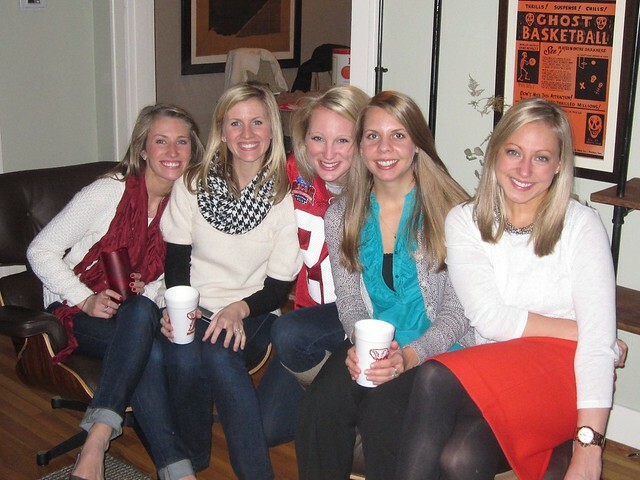 Invitation to our BCS National Championship watching party! The last time Alabama was in the BCS National Championship game, 2009, we were living in Austin, TX and I wanted SO badly to go to the game. It was in Pasadena at the Rose Bowl and I tried so hard to get us tickets. I actually thought I had snagged us some at one point but it turned out to be too good to be true. We hosted some friends over at our house to watch the game and I swore up and down that the next time we were in the Championship game, I would be there. Little did I know that it would be a short 2 years later and we would be living on the other side of the country. Needless to say, we weren’t able to make it to the game this year either. It was in New Orleans and I’m quite sure I was one of the ONLY ones that wasn’t there out of my college friends (that is an exaggeration but it’s almost true). I was glad the game was so close to UA because it makes for easy traveling for the fan base. 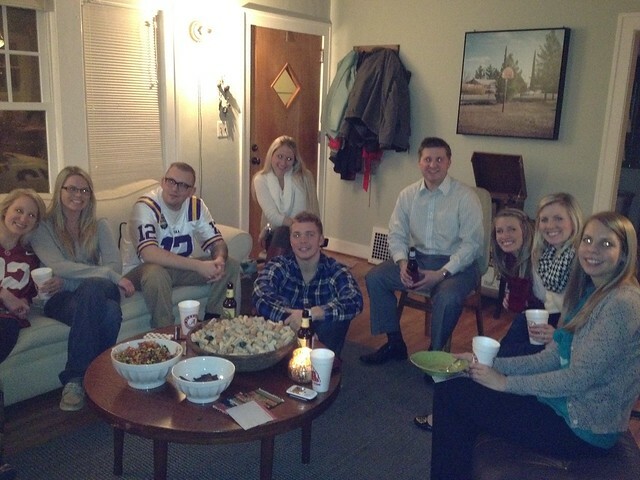 And though I was very sad we weren’t going to be able to afford to get there, I planned a BCS National Championship watching party at our house to make up for it! 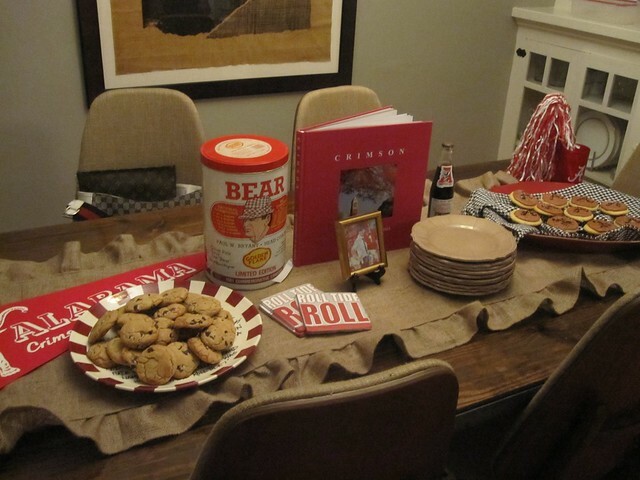 I pulled out a lot of my Alabama memorabilia for the dining room table. 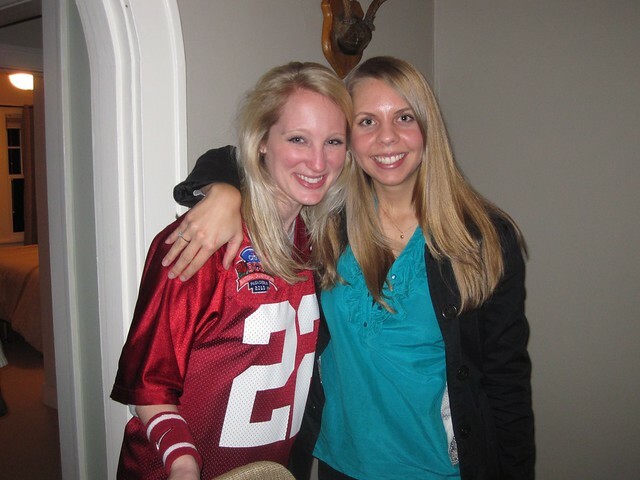 I wore my jersey from the last championship and invited over all my Junior League girls (luckily they are mostly SEC fans and NONE from LSU so they were all pulling for Bama!) We had a few other friends join us as well that are football fans though it’s hard to find SEC fans out here in Oregon! Even my sweet husband was able to make it for the second half–he’s juggling graduate school, teaching, free lance work, etc. He’s a busy bee! But he came in at the beginning of half time, changed into his Bama shirt and was ready to cheer on the Tide for the second half of the game!! So incredibly thankful for this girl and her husband! I made two fans of Yellow Hammers out of these ladies. Because I was no where NEAR the game, I felt I needed to bring Alabama to my friends here. I made Yellow Hammers and they were a huge hit! In case you don’t know, Yellow Hammers are the drink that is served at Gallettes, a bar on the Strip, on game days. I only had one of my classic Gallettes cups here in Oregon with me but I did have a bunch of Alabama styrofoam cups for everyone’s drinking pleasure. And if you’re curious the recipe, shoot me a message and I’ll give it to you! 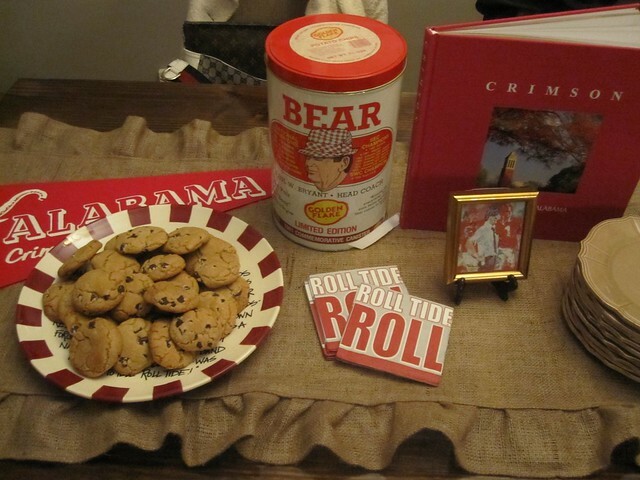 I whipped out a bunch of my Alabama memorabilia for the tables-cape! 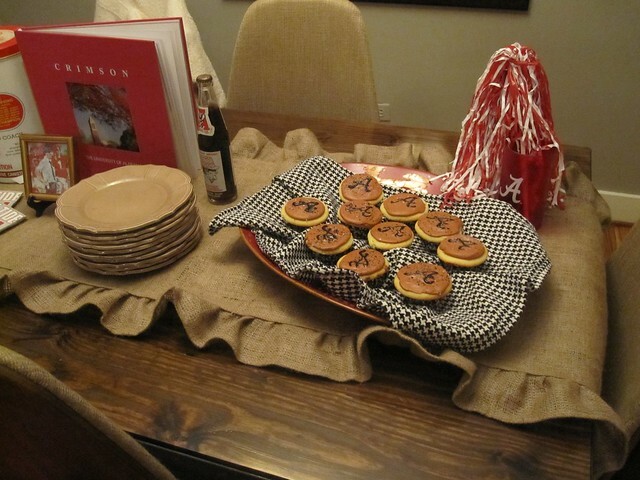 Alabama ‘A’ cupcakes made by Ashley and her sister Jamie! 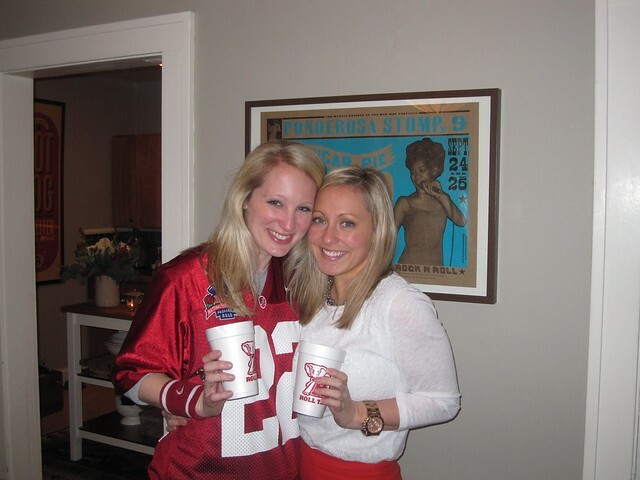 Miss Casey and I and our cups! Glad that Ole Miss grad was able to come cheer on my team! She’s so gracious! Overall it was a wonderful evening filled with wonderful company and an even MORE wonderful outcome to the game (sorry to any LSU fans out there)! I may or may not have cried at the end of the game. And like each week, our victory was topped off with a phone call from my Mimi. 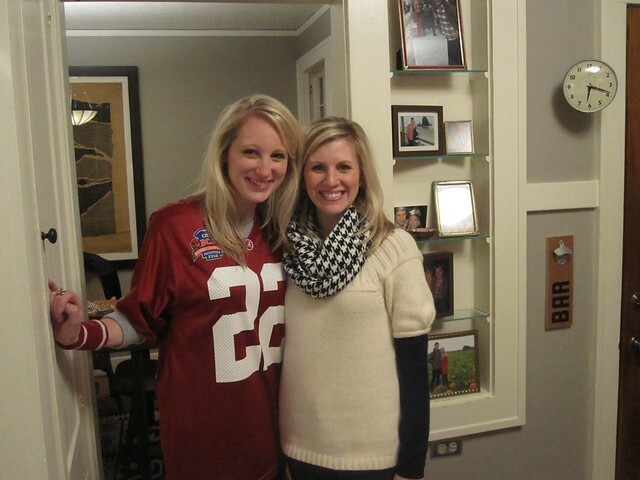 We talk after every Bama win and she and I were both in tears this year. What a sweet victory and end to a wonderful season. 14 National titles. You can’t beat that! I am convinced that no one but fellow Southerners will understand how much a football victory can mean to you and your family. And I don’t expect anyone to understand why it brings me to tears. But it does. 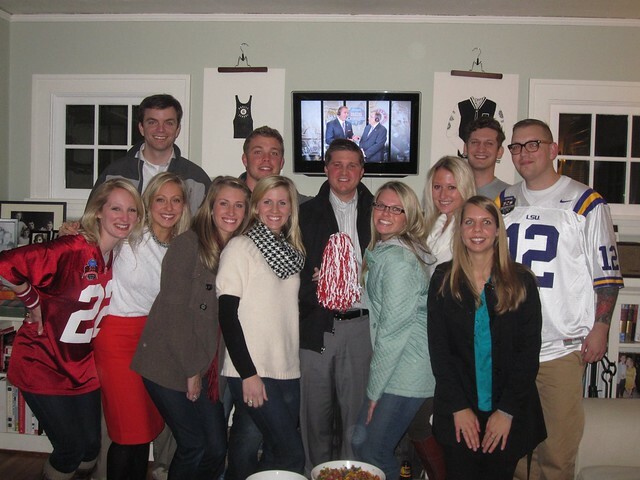 Today and ALWAYS I am PROUD to be an alumna of the University of Alabama. Even though my daddy considers it a somewhat inferior school, UA gave me 4 of the BEST years of my life. 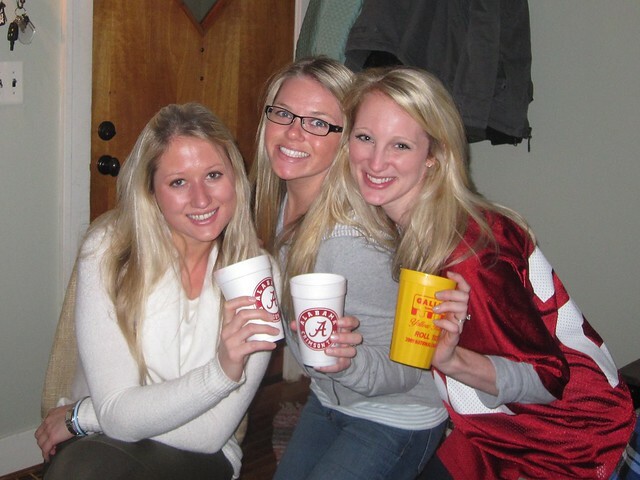 ROLL TIDE ROLL! –And as one more side note, if you are a Bama fan, you know THIS win was special because Nick Saban was grinning from ear to ear! My amazing wristbands from Mr. Lonny Hurley!